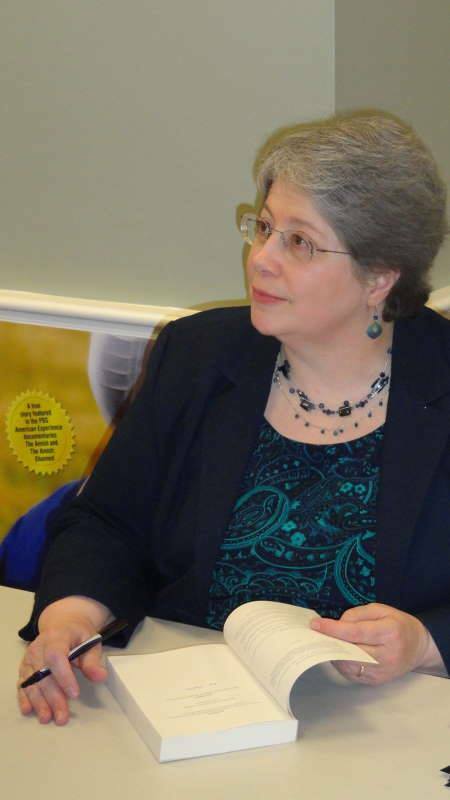 Author Saloma Miller Furlong at a book signing. 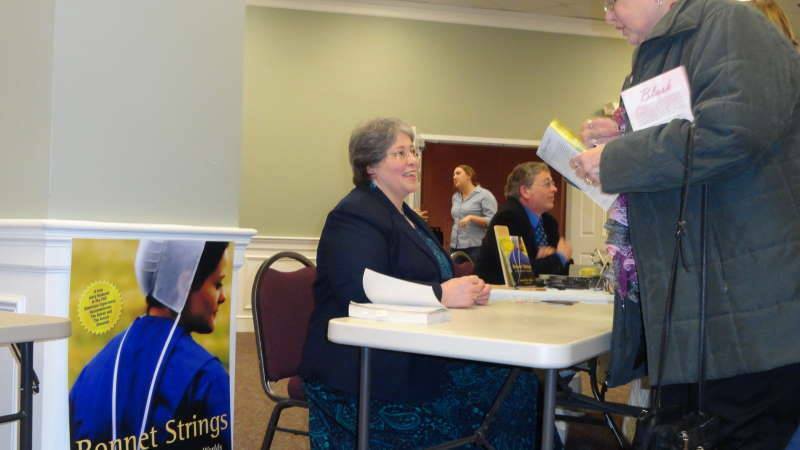 The initial publication buzz is off for Bonnet Strings: An Amish Woman’s Ties to Two Worlds—a book Herald Press released this past January, written by Saloma Miller Furlong. I wondered if I was too late for some reflections (not so much a review, since I work for the publisher, who would believe I would be objective?). It took me awhile to get around to reading Bonnet Strings—lots of others on my stack. Knowing a little of the conflicted nature of Saloma’s family struggles and abuse in Saloma’s earlier book, Why I Left the Amish (although I haven’t read that one), I wasn’t sure I wanted to wade into this one. David Furlong, Saloma Furlong, and Shirley Hershey Showalter at Herald Press/MennoMedia luncheon. Then I saw a comment by Shirley Hershey Showalter, author of Blush: A Mennonite Girl Meets A Glittering World, which was published a year ago—that she still appreciated a “late” review “after the initial book rush is over” (here, by Leanne Dyck). As a fellow author/editor, I know these things take time to be read and gel in the mind of the reader or reviewer—and then get into a publication cycle. Saloma has quite a life story: how many of us actually successfully run hundreds of miles away from home (as adults) on a Greyhound bus and try to start a new life with a new name, place to live, job, and have the elders of our church, family, or community come not once but twice (she hid effectively from them the first time) to hunt us down and carry us back to kith and kin? How Saloma wrestles through the dilemmas caused by her deep love for her community, faith and family while also struggling with the rules and rigor of Amish life is the core of her second memoir. Bonnet Strings starts out with 20-year-old Saloma increasingly frustrated by the restrictions of Amish community life. Her family also had some outstanding problems, including a father in desperate need of medication and counseling, and a mother reluctant to get help at that point even though Saloma had made initial inquiries about such. So there’s the conflict and crux of the plot. 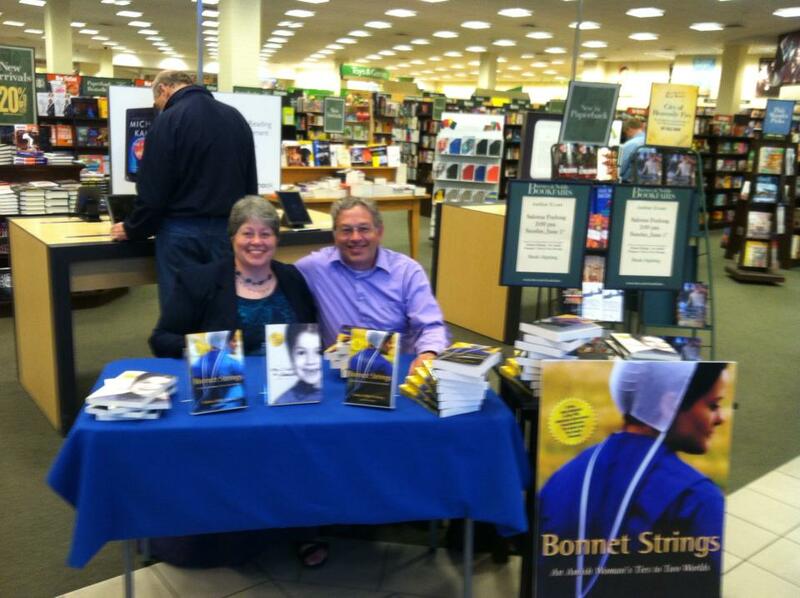 At the Harrisonburg Barnes & Noble book signing. I was delighted to meet the author last spring when she and her husband David Furlong came through Harrisonburg on a self-sponsored book tour. They are both genuinely likeable, lovely, personable and engaging human beings. It is important to realize that Saloma has lived most of her life quietly and quite happily, out of any limelight cast by authoring two memoir-type books and telling parts of her story in two PBS documentaries, “The Amish” and “The Amish: Shunned.” Since I also wrote two memoir-type books about my own young adult years (On Troublesome Creek, Departure), I know what writing about earlier experiences can do in terms of processing and capturing the memories and the learnings—and translating how those life experiences can connect with others. I also know from working on documentaries myself—interviewing and helping people relate their stories, is often transformative—helpful and life-changing for the teller and those of us who share or hear their stories. Saloma’s comments on community in her book gave me much to think about, and also made me reflect on and better understand my own relationships and connections to Old Order Amish or Mennonite friends and family through the years. Through one of my associations with a local Old Order Mennonite community here in Virginia, I began to pick up vibes that although my friends welcomed us royally when we visited, a bishop expressed concern to my friends about too much contact. After reading Saloma’s book, I better understand the why behind that distancing. Belonging to an Amish community requires strict adherence to community rules and expectations, and for Saloma, absolutely stifled her individual growth and interest in further education. She asks, can you have community without full faithfulness to community guidelines? While some communities say sure, for most Old Order Amish or Old Order Mennonite the answer is no. Thankfully in most Christian communities—however defined—the answer is yes. I think of my own church (Presbyterian now) and small group/house church experiences. These are defined communities. There are certain expectations in membership, sure, and as house churches we write and sign new covenants each year in which we set group goals and promise to maintain certain spiritual disciplines. But thanks be to God, there is latitude, grace (when we don’t complete every jot and tittle of our covenant and goals) and a wide embrace. Saloma genuinely enjoys talking to readers and answering questions. I admire Saloma Miller Furlong and Shirley Hershey Showalter: followers of Christ living out their unique calls as children and women of God. Each has a different community with different parameters. Who is to say which is harder: to live within a strict community with boundaries all spelled out and enforced, or to live a Christian life with boundaries less clear but trying to be just as faithful? Can you have community without full faithfulness to community guidelines? 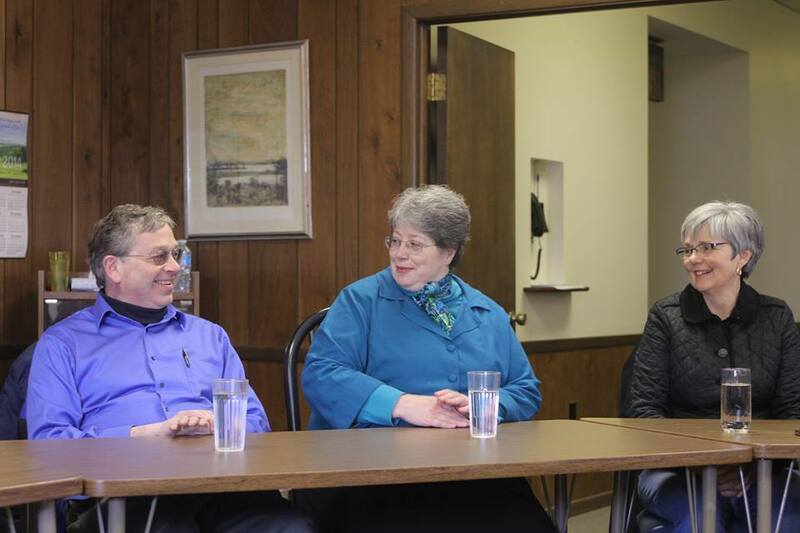 For more on differences among Mennonites, Amish and Old Order groups, check here. What is community without full faithfulness to community guidelines? I guess move to Pinecraft in Sarasota Florida and be a friend to everyone on the streets. And never judge to find fault with other peoples’ religion. It would be interesting to know where you are coming from, with the reference to Pinecraft–I know that the “rules” are relaxed there for Amish in Sarasota on winter holiday. I do think you are right on about “not judging” or finding fault with other peoples’ religion. Good to hear from you! Yes, we are to be a friend to everyone on the street and not judge others, thank you Ketty. Always a good reminder. Community means the world to me (and my sisters) as we are going through the hard work of assigning another life to Mother’s things. Bossler’s Mennonite, her home church and my former one, have been consistently helpful through the funeral and now the process of boxing up possessions and selling property. Pastor Fred and Linda Garber anticipate our needs, offer help, most recently the name of a plumber to fix a leak! Great post, Melodie. I love this specific example/illustration of what community means in a very practical way. How do people manage without a church community? You are doing hard work. Blessings, my friend. I love your the question you posted: Who is to say which is harder: to live within a strict community with boundaries all spelled out and enforced, or to live a Christian life with boundaries less clear but trying to be just as faithful? I can speak for myself in saying that it is easier to live a Christian life with the boundaries less clear and being just as faithful because God gave us a conscience to be our own guide to find the path we are meant to walk. When I was living the Amish life, it seemed that I was giving up my own conscience and instead following the community conscience. And in a Christian community we come together with others with whom we share spiritual beliefs. Your question about what community means to me is also thought-provoking. I find compassion (what I think of as common passion) is a key element and it is often in relating to each others stories that we find our common interests, which is what brings us together as people, whether in a love relationship, friendship, or a larger community. So I believe where we have compassion and common interests, we have community. Thanks for your follow up thoughts, Saloma–this is another good angle–the role of personal conscience and how that plays in following the Christian life. Regarding “common passion” (love that, original with you?? )–while I enjoy talking to and being around folks with whom I share common interests, in my church community I often have to think of what a motley crew we are–with quite different interests and even political opinions but come around the communion or fellowship table together anyway. Yes, the common passion idea came to me as I was writing my comment. We don’t have to all be the same to be in community, but we have to have some THING that we share an interest in. These things keep bringing us together. Your community sounds very interesting. So glad you are enjoying fellowship in your Christian community. As a Hutterite, I’ve lived in Christian community all my life, and the sense of belonging is very strong for me here. As a contributing member I’m honoured to follow our community guidelines. But for me, community doesn’t stop here, it’s far-reaching to fellow believers and friends in many areas of the world, people I’ve crossed paths with, some of which I’ve never even met, but have a special connection with. Most recently, I’ve come in contact with, via emails and phone calls, Herald Press employees who I have this sense of community with. I’m working on a book and Valerie Weaver-Zercher is my editor. The very heart of my book is my Hutterite community and I hope I can convey this clearly and just how grateful I am for it. Linda, how great to be in touch with you this way and on this topic. Yes, Valerie is my colleague–although she works from her home in another state–but we are so pleased to have you working on this book. I hope too you are able to convey what is to hard to do in words–what Hutterite community is all about. I think I only have a small sense of what it really means. I like your perspective in terms of reaching out beyond your own community. We will be happy to have you share blog posts when it gets closer to your book coming out. I believe the title is “Hutterite Diaries: Life in My Prairie Community” and it is planned for release next May, right? Blessings! This has been a thought provoker for me. I read it daily, trying to think of how best to answer. I would say my community is my family and extended family, which overlaps with my physical church/our church school to a certain extent (for those in the area) and to our religious persuasion as re’ my distant (distanced) family. Also our background ethnicity is very strong, the Swiss German. This community is a very steadying and satisfying one…we cherish the closeness of family relationships and multiple generations under one roof. My cousins are my best friends…my oldest girl is in business with her cousins. Ones who go away for college return to settle down within a certain geographic closeness, often adding their spouse’s family into the mix. As do we keep all the rules? Rules…we’re a pretty mixed bunch. Some are more conservative in dress than others though I have never seen a mini skirt or bare midriff on any female that I can think of. Guidelines are there for a reason, but we don’t want to move over into legalism. We keep the Sabbath…we practice peace…we do our humanly best in the day to day world to live our life acceptable to our Lord. My dear, thanks for reflecting on this so frequently to come up with a comment! That is special. I envy–really envy–the fact that the kids who go away to college come back, or nearby. Wow, how does your community manage that! I can’t complain about my own kids, however, since I settled 600 miles away from family, near my spouse’s family. I am SO grateful though we are near his family: my sister-in-law is as close as any of my sisters. Thanks be to God. Love your thoughts and reflection and the special reminder to keep the Sabbath (without being legalistic). Love it. « What Says Fall to You?